Hello everyone! I will get straight to it and let you know about what I did this past week. I do know about transfers because they changed it up this time but I am going to have you wait until the end of my email! It was a normal P-day. We emailed and went shopping. I was able to buy a jacket because it is finally cooling down here yay! This is the weather I love in California. I had dinner at the Larson's home the one who I want Kels to marry. That was really fun, I just love that family a lot! After we went and taught the Scott family (Bishop) Word of Wisdom and Chastity. That went great! Sister Heagy and I taught that and it went super great! We went to the Scott's home again to have studies there and to have companion study with their daughter Jessica don't worry I have a picture of this family so you can put a face to the name! That went really well because we were able to learn many things from her. After we went to District Meeting which was awesome as always. We went and ate at this little pizza place as a district. Its called Toni's Pizza and they are Italian and are super friendly. They asked us questions about the church. Pres and Sis Hobbs found this place and have told everyone to go there because the people are so nice and the food is yummy! We are working as a mission to convert the owners haha After we walked back to our car when this lady walks up to us and starts talking with us. She appreciates all that we do and says that she knows our church is true because her first husband passed away and before he did he told her that he saw Heavenly Father and Jesus Christ and Joseph Smith. She isn't a member and since then has been remarried but she feels that they have another path for her right now. We are going to bring by the restoration DVD for her at her work and start there with her. She is a super sweet lady and we were so blessed to talk with her. This morning we were able to do service for one of my favorite families in the ward who is moving to Utah! I was sad but happy because they are moving to Sandy and they said they would love to make it to my homecoming haha We were there to help her pack up. She has MS and gets tried and so she just asked for our help it was fun! We came across her wedding video and she let us watch it! Everything that could have gone wrong went wrong for them on their wedding day. It was really sad but funny. She now laughs about the whole day. After I went to my Dr's appointment. I wrote a letter explaining what happened but they weren't able to remove it then so it was just an exam. I am calling today to set up an appointment soon. He explained the procedure and I am not looking forward to it but Sister Hobbs told me that she will take me and be my mom for that moment! I love that lady so much!! We had an appointment with a part member family, Julie and Laz Peterson. We shared the 30 day challenge with them because Julie wants to take things slow for now but is interested about learning more. It went really well and we are excited that the work is starting to pick up! After we had a practice lesson with Sis. Starr ( I have a picture of her as well) We taught her the restoration MOTR and that was fun. We had meetings in the morning at the mission office and then Sister Morones went home today so we were able to say goodbye. I didn't like doing that because I have grown so close with her but I know it was good for her to go home because she needs to find out what is wrong with her. But it sure wasn't an easy goodbye. We had the Rancho Cucamonga Service Fair that we went to. There were booths there for the community to sign up for service opportunities. We were there all day signing up and just letting people see who we are. Many people came up and talked with us members and non members and we found many many service opportunities. It was a wonderful day!! It was a normal Sunday. After church we went to many families in the ward to get pictures with our favorite people which was fun. That night we had dinner at the Scott's home and they had BYD so we stayed for a minute to that but then needed to go home and pack. Okay so the new things about transfers is that on Thursday nights we get training calls. So they call and tell us if we are training or not. We got a call from the AP's and Sister Miles will be training but Sister Heagy and I will not be. We both were happy we didn't have to stress about training but sad about it as well. On Saturday they would call us and let us know what area we are going to be in and who our companion is going to be. So after the Service Fair we got our call from our ZL's.... I am staying in San Sevaine with SISTER HEAGY!!!!! Oh man you should have seen us when we heard. it took us a minute to process and then we freaked out!! We were screaming and jumping up and down with each other haha it was the best news ever!! We calmed down so sister miles could hear her fate. She is training in Apple Valley in the Desert. We are so happy for her because she loves the desert but sad because that is pretty far but its okay because we get to see her on Saturday because we are having a sisters conference. 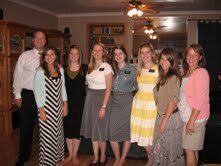 So all the sisters in the mission are getting together to watch the RS broadcast! Well that is all that has been going on with me and I will send pictures and email you all back! I love you all so much and miss you tons! You all are always in my prayers and my thoughts.